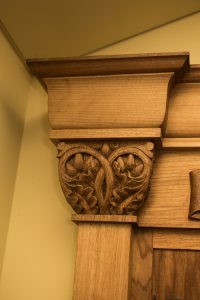 Honour roll carved 1926, Launceston Church Grammar School . Who was Nellie Payne? Honour roll, Launceston Church Grammar School. Detail on honour roll, Launceston Church Grammar School. 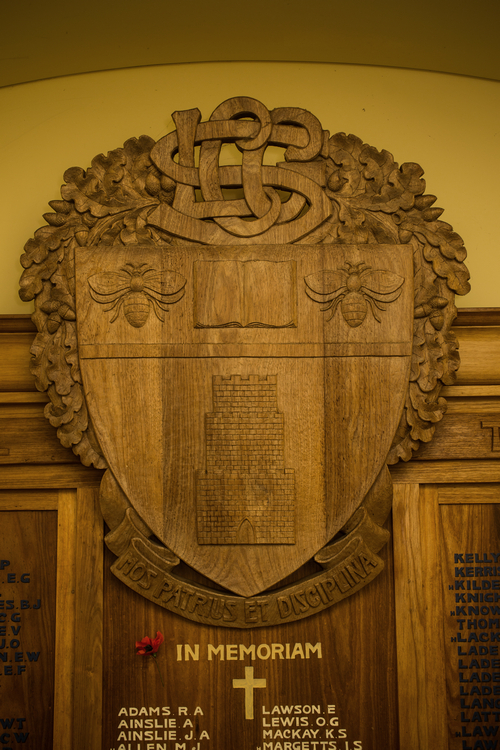 Close up shield on honour roll, Launceston Church Grammar School. A large number of old scholars, parents, and friend yesterday afternoon visited the Launceston Church Grammar School to take part in the ceremony of the unveiling and dedication of the new roll of honour, which was preceded by an impressive service. 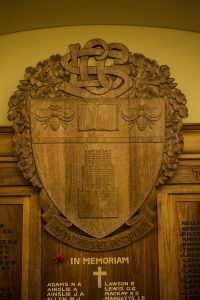 The scholars were drawn up in ranks before the platform erected in the large dining hall, which, at the commencement of the service at 3 o’clock, was taxed to its utmost capacity. After the offering of the Lord’s Prayer, Rev. J. W. Bethune (principal of the school) read prayers for the Empire and for the fallen. Kipling’s “Recessional” was then sung, after which the Mayor (Major A. A. Evans) addressed the gathering. In the course of his speech Major Evans said that they had assembled to take part in a very solemn and impressive ceremony the unveiling of a scroll of fame to perpetuate the memory of the old boys of the school who had fought the fight of freedom during the Great War. These old boys had gone forth willingly to fight for their country. They knew that if might over right became law their country would not be a fit place in which to live. They knew that might would not overrule right as long as free men remained in the world. They knew that the Germans had made great preparations for the war because they had seen rise merciless destruction in France, Flanders, and Belgium. Those brave men answered the call, and everyone knew today the price they paid. Continuing, Major Evans said that 500 boys from the Grammar School had answered the call. That number represented half a battalion of infantry, the boys who always went over the top; a squadron of Light Horse, whose deeds in the Holy Land would ever be remembered; almost a brigade of artillery, to which unit the speaker had the honour to belong. That was a record which he believed no equal, and of which all were justly proud. No less than 98 of those splendid men made the supreme sacrifice and he knew that some of those men who fell were fathers and brothers of some of the boys assembled before him. The actions of those brave men recalled the ever-to-be-remembered words, “Greater love hath no man than this, that he lay down his life for a friend.” The speaker was sure that if those 98 gallant heroes knew what was being done in their honour at that particular time they would say, in their modest, sporting manner. “Well played, Grammar. Well rowed, blue and gold!” In conclusion, Major Evans urged the boys present to keep to the straight path always, and if at any time they found themselves slipping to look reverently upon the names of those on the honour roll before them. The Mayor then unveiled the tablet, saying, “As Mayor of this city and as an old boy of the school, I now unveil this honour board. It has been given by the headmaster in grateful memory of the deeds done by the old boys of the school in the Great War.” Mr. Bethune then performed the dedication ceremony, and the National Anthem concluded the service. Mr. Bethune extended a cordial invitation to those wishing to visit the various departments of the school. The new honour roll was made by Mrs. Payne, widow of the late Dr. Payne of Hobart, and comprises pieces of beautifully carved blackwood. On it are engraved the names of the 500 old boys who answered the call and in the centre the names of those who made the supreme sacrifice. 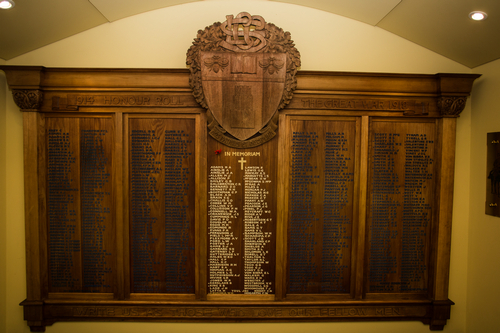 The engraving in big letters, “1914-Honour Roll-The Great War-1918,” runs across the board above the names, and the Grammar School coat of arms stands out in the centre of the large engraving. The board is a very fine memorial, and one of which the school will ever be proud. Before the gathering dispersed the Mayor, on behalf of the scholars expressed appreciation of the headmaster’ fine gift and Mrs. Payne’s beautiful work. Rev. C. G. Wilkinson also paid a tribute to Mrs. Payne’s work, and recalled a previous occasion on which Mrs. Payne had made a chair and presented it to the school in memory of her nephew who fell in France.